The Three-eyed Radiologist (TR) has been asked by The Skeptical Cardiologist (SC) to discuss the epidemic of incidental pulmonary nodules that are found on routine cardiac diagnostic studies including coronary calcium CTs, coronary CTAs, and myocardial perfusion scans (using CT for attenuation correction), not to mention a whole host of other CT (computed tomography or “CAT”) scans and x-ray exams performed for many reasons that have nothing to do with inspecting lungs for pulmonary nodules. The TR will herein anticipate and answer common questions that might be asked by the SC audience. What is a pulmonary nodule (and why should I care)? A pulmonary nodule is a nonspecific “spot” or lesion or density seen in the lung (1). It could be nothing. It could indicate lung cancer, and that is why you should care. Larger nodules, say 8 mm or larger (bigger than one-third of an inch), are of greater concern than smaller ones, but size alone is not an indicator of malignancy or benignity. 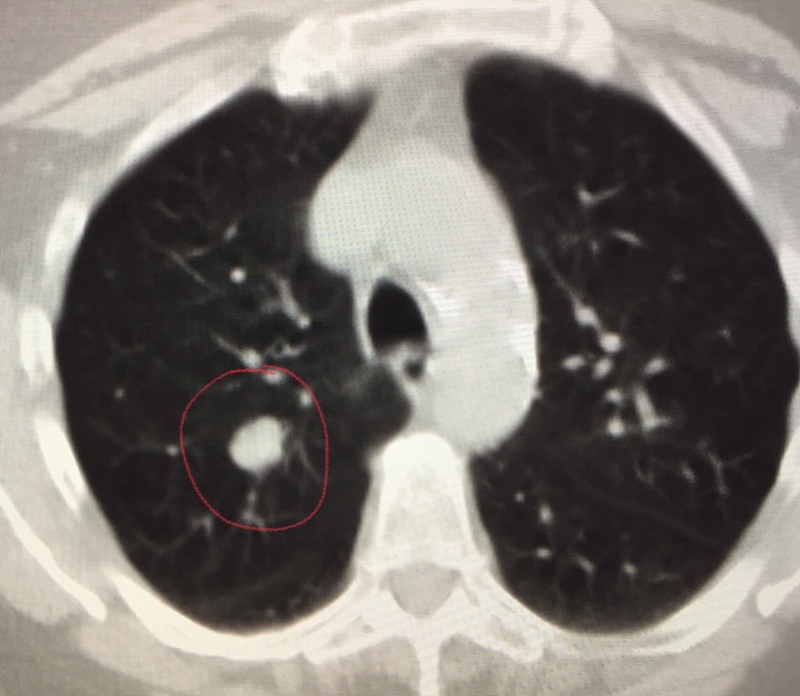 An incidental pulmonary nodule (inside red circle) discovered on a CT scan of the chest which was done in conjunction with a nuclear stress test. A nodule may initially appear to be benign but upon further investigation be malignant—or vice versa. It could be a scar. It could indicate an old infection of no consequence. It could indicate an active infection or inflammation. Again, it is a nonspecific finding that requires further thought, analysis and maybe additional testing. 2. Okay, you scared me by mentioning cancer. What should I do about a pulmonary nodule? In many instances, the nodule can be dismissed if it has characteristic imaging features of a granuloma (calcium) or hamartome (fat) or if it can be shown to be stable over time (at least two years in many typical nodules). In most other cases, the nodule will require a follow up scan or two, and occasionally a PET scan and or a consultation with a lung doctor (a pulmonologist). Less frequently, the nodule will need a biopsy or to be removed, especially if it is likely or proven to represent cancer. 3. How common are pulmonary nodules? Very common. In fact, last week the TR’s own 85 year old father texted him to tell him about the incidental pulmonary nodule discovered in the right lung when he was having a CT scan of the kidneys for blood in the urine. The TR spends a good deal of his work day following pulmonary nodules with serial chest CT scans and discovers them regularly, too. The American Thoracic Society estimates that as many as one half of all people getting an x-ray or CT scan that includes part of the lungs has a pulmonary nodule (1). The TR’s experience is that the number is quite a bit lower in actual practice. 4. I have a pulmonary nodule. What should I do about it? First, do not panic. Much of the time, this amounts to very little. There are evidence-based consensus recommendations called, The Fleischner Society Guidelines (2), created with input from leading chest radiologists, pulmonologists, and chest surgeons, to advise the doctor and patient to manage these incidental lung nodules. It was updated in early 2017, and the new guidelines represent the state-of-the-art for handling this medically common scenario. Based on the size and appearance, there are standardized work up and follow up protocols. The TR was positively pleased to see that the new recommendations are much less aggressive than the early version, previously requiring more frequent workup and monitoring for minuscule nodules that never seemed to amount for much. As the TR ages, his visual acuity for small things is naturally declining, and he is thrilled that the tiniest nodules can now usually be ignored. 5. While I have you here, TR, what’s the deal with lung cancer screening? Lung cancer screening is a newer test, using low dose CT scans, for the early detection of lung cancer in a subset of people with a history of smoking (3). It was graded “B”, by the USPSTF, for its life saving potential (for comparison, screening mammography gets a “C” grade) and is offered to Medicare and commercial insurance patients who qualify, based mostly on age and smoking history. The CT scans are used to detect and follow the same nodules discussed above. If you are a smoker or former smoker, consider a discussion with your doctor as to whether or not lung cancer screening might benefit you. 6. Thank you, TR. What can I do to repay you for this useful information? Do not tell the SC, but the TR loves salted caramel gelato and will accept gelato donations. Previous PostWhy Doesn’t The USA Have Graphic Warning Labels On Cigarette Packs Like The Netherlands?Next PostHow Much Does or Should An Echocardiogram Cost? Hello and thank you I am scared to death a nodule was found on my ct scan ,it was the lungs ,and my appointment is coming up ,I was a smoker some time ago ,hope everything goes well after reading your information thanks.